Brady Martino of Savannah College of Art and Design (on left) introduced teammate Boyu Liu (on right) as "Our amazing walk-trot rider." 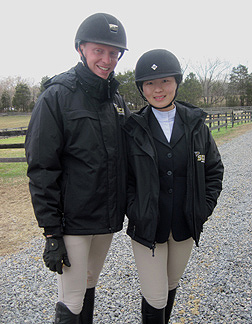 This was before Liu went out and won her walk-trot class for SCAD's Team Bumble during the Winter Tournament of Champions invitational show in Fredericksburg, Virginia on January 26th. From Beijing, China, Liu was the first SCAD rider of the day to win a class but most definitely not the last. Fredericksburg, VA - Though the Tournament of Champions series has been around since 1991 no school had ever won all three Tournament events during a season in which three or more of the competitions were held. That is until now. Savannah College of Art and Design, with two separate squads entered on January 26th, earned high point team honors for the third time this season. SCAD's Team Bumble won a close contest with Bridgewater College by a 43-41 score. SCAD Sophomore Brady Martino won the novice flat class which concluded the team competition. Headed into the second section of novice flat both Bumble and Bridgewater had been tied at 36 points. Having been High Point Team at both Randolph College in September (the Pre-Season TOC) and Otterbein University in December (the Holiday TOC) the victory gave SCAD a place in the series record books and another Series Champion Trophy. At the end of the final Tournament event of the season the combined scores of a schools' top two tournament shows are combined. 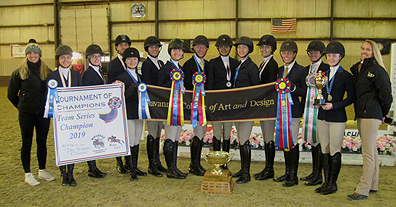 The school with the best average of those two shows is the series champion trophy winner, and for six years and counting the Trophy has found a home in Savannah, Georgia (or Hardeeville, South Carolina, a stone's throw from Savannah where SCAD's Ronald C. Waranch Equestrian Center is located). 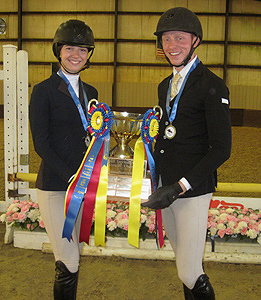 SCAD's success was not limited to the team competition, as the High Medal and Low Medal division champions for the day were also SCAD riders. Martino won the low medal, his second time taking the blue in the division in less than two months. From Easton, Pennsylvania (where he trains in the off-season with first-year Lafayette College head coach Kelly Poff), Martino won the low medal at Findlay the first weekend in December. Over his first two seasons at SCAD Martino has won the low medal four times. The high medal winner was Maddy Keck, a SCAD sophomore from Allamuchy, New Jersey who had won the exact same division on September 22nd at Randolph. Finishing in third in the high medal was Adam Edgar, who now has a first, two seconds and a third in the division. From Leesburg, Virginia, Edgar is another member of the class of '21 along with Keck and Martino who has found considerable success in Tournament events as well as traditional IHSA shows through only three semesters. From left to right are Megan Heffernan, head coach Jerry Schurink and Michael Golinowski of Bridgewater College. Heffernan had just won her intermediate flat class to make the Eagles two-for-two in the blue ribbon department early in the day. Bridgewater would lead for much of the day before the SCAD Bumble team would tie them headed into the final team class. Believe it or not if you had walked into the arena after the first seven official classes and looked at the list of blue ribbon winners up to that moment not one was a member of "team bumble" or SCAD's other entry, "team honey." Bridgewater College had a solid lead at that point, having scored 21 points over only four rides. Michael Golinowski, a freshman from Burke, Virginia won the first open over fences class while teammate Megan Heffernan won the section of intermediate flat which immediately followed. After two classes came and went without a Bridgewater rider entered, the Eagles third rider of the day, Hannah Foster, was second in walk-trot-canter. Caroline Shipe added a fifth in intermediate fences in the class which followed. However the eighth team class (class ten in the official program, owing to a pair of classes being listed which are really separate sections of the flat phase of the high medal) is where team bumble began their ascent. 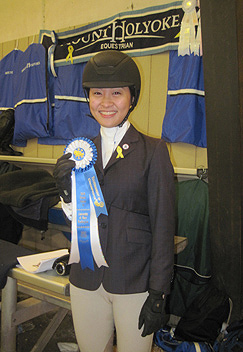 Boyu Liu, a sophomore from Beijing, China was the Bumble walk-trot rider and her canterless ride in section A of walk-trot provided SCAD with their first blue ribbon. A team honey rider, Addison Diaz, proceeded to win the novice flat class that followed. Edgar was second for bumble in open flat before junior Ally Bates won her walk-trot-canter also for bumble. Martino was second in novice fences for Bumble in the very next class. Three classes later Martino won novice flat as mentioned earlier. During this time Bridgewater was holding their own against the field. Jessica Goodman was fourth in walk-trot prior to a quirk in the schedule that meant no Bridgewater rider showed in four consecutive classes. When Bridgewater finally had a rider in a team class again Katelyn Dugan came through with a first in novice fences. Golinowski was second in the open flat class which followed. Following novice fences section B in which Bridgewater did not have a rider entered Isabel Ammendola was second in novice flat to close out the scoring with 41 points. When combined with a score of 29 at the September 22nd Pre-Season TOC the Eagles were not only second on January 26th but also the Reserve Champion in the 2018-19 tournament series. Perhaps it is a coincidence, but the top four teams at Hazelwild Farm at the Winter Tournament were also the top four in the ribbons for the entire 2018-19 series. Third for the day (and season) was Goucher College. The Gophers were led by Irene Elise Powlick, a freshman from Salt Lake City, Utah who was among those who rode in two team classes and the high medal. Powlick started her day with a third in open fences (behind Golinowski and the University of Delaware's Alyssa Kelly) and much later won her open flat (holding Golinowski to the red ribbon). The last individual award presented at the show was the top ten in the high medal, in which Powlick was ninth. Nadia Langer contributed a second in novice flat behind Diaz. Goucher was one of five schools (the others being SCAD, Ohio University, Miami University of Ohio, Randolph College) to compete at each of the three 2018-19 TOC shows. The Gophers scored 28 on September 22nd, 27 on December 1st and 30 on January 26th thus proving to be very consistant against the field. She had been successful as a walk-trot-canter rider. Due to extenuating circumstances Courtney Lewis of Ohio University (pictured) was moved up for the Winter Tourney to the novice fences division. Despite never having jumped in an IHSA show Lewis proceeded to place second over fences to earn the Bobcat's final five points of the afternoon. The school which finished fourth was riding with a heavy heart as one week earlier arguably their best rider was hospitalized with what has been diagnosed as a brain tumor. Ohio University open rider Maddie Davis had complained of headaches before being diagnosed, though remarkably her riding was still superb which made the news all the more unexpected to teammates and coaches alike. Prior to the start of the Winter Tournament buttons were handed out to coaches and riders which said "Mighty Madeline" in the center while the circumference read "Goodbye Earl." The latter is a reference to a song the Dixie Chicks made famous in 2000. In the song a man named Earl does many bad things that eventually lead to his being poisoned. Davis decided to name the tumor Earl and get others fired up that the tumor will be short-lived. According to Ohio University co-coach Jim Arrigon (who also started the Tournament of Champions series and puts on these shows every year with wife and co-coach Gwen) Davis was campaigning to the doctors to be let out of the hospital to go compete in the January 26th competition. It should be noted that the Arrigons have known Davis since long before college as she trained at their Beckett Run Farm in Ohio from an early age. Davis previously had competed at many TOC events, not only for Ohio University but also for Randolph College as she was a Wildcat for over two seasons before becoming a Bobcat (At the time this story was posted on February 3rd Campus Equestrian did not have an update on Davis). Jim Arrigon put a full page Maddie Davis biography into the program and asked that everyone keep her in their thoughts and prayers. The Ohio University Bobcats rallied around their missing rider, surprisingly earning their top TOC placing of the season with several riders showing in higher levels than they had to date. Lenna Hoff, a junior from Youngstown, Ohio had Ohio U's first two rides. After a sixth in intermediate flat Hoff got off one horse and right onto another and won in open fences (besting Edgar of SCAD, not an easy thing to do). Katie Kemp of the Bobcats would place fourth in both intermediate fences and open flat. Had things been different, Davis would have had both of these open rides. Arienne Martin (in novice flat) and McKenna Devitch (in walk-trot) were third place winners. The final Ohio University team rider to show was sophomore Courtney Lewis. From Columbus, Ohio Lewis had been a walk-trot-canter rider and to this moment had never jumped in an IHSA-related competition. Bumped up from WTC as part of the domino effect of Davis's absence, Lewis proceeded to place second in novice over fences and raise the Bobcat's total to 27 points. Ohio University was even more consistant over three tourney shows than Goucher, scoring 26, then 26 again and finally 27 to earn fourth both for the day and for the 2018-19 series. Who would have thought that the city of Beijing, China was a hotbed of walk-trot riders? Just like Liu of SCAD Christine Xiao of Mount Holyoke College (pictured) hails from Beijing and she too was a winner in the other walk-trot class. At Tournament shows each division is held twice in order to keep class size from seven to ten riders. Following the SCAD Honey squad in fifth place was Mount Holyoke College. The Lyons technically tied for sixth with Randolph College but received the higher team ribbon thanks to winning two blue ribbons to the Wildcats' one. Sinead O'Sullivan, a sophomore from Worcester, Massachusetts won her walk-trot-canter while Christine Xiao, a sophomore from Beijing, China won her walk-trot to help Mount Holyoke be perfect at the lower levels. The Lyons were officially fifth place for the TOC series as a bonus. Randolph College, with an uncertain future as Equestrian will no longer be a varsity sport at the school after the 2018-19 season, continued to impress during what they themselves have called "The Last Stand." The Wildcats scored 23 points for their high score at a 2018-19 TOC event. Currently leading the University of Virginia by 20 points and Bridgewater College by 31 in the IHSA Zone 4, Region 2 team standings, Randolph was led today by Molly McLaughlin. A sophomore from Owings, Maryland, McLaughlin won the first section of intermediate fences. 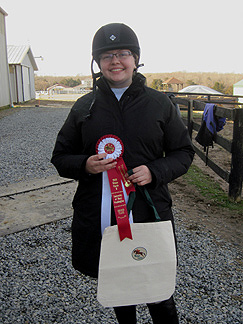 Walk-trot rider Katie Brown was second to SCAD's Liu for the Wildcat's lone red ribbon of the day. Sweet Briar College rounded out the top eight schools to receive team ribbons at Hazelwild with 21 points. Sophomore Kaitlin Duecker was second in intermediate flat behind Heffernan and fifth in open fences to lead the Vixens. Miami University of Ohio just missed out on a team ribbon with 20 points. The Red Hawks were led by open rider Victoria Lawler. A senior from Hudson, Ohio, Lawler won the first of two sections of open flat while also placing second between Keck and Edgar in the high medal class. Teammate Tess Von Hemel was second in intermediate fences behind McLaughlin and sixth in intermediate flat. Three schools scored 17 points, with Rutgers University getting listed first by way of a tiebreaker. Nobody won two firsts today but Meghan McSpiritt of the Scarlet Knights was first in novice fences (ahead of first-time jumper Lewis) and second in intermediate flat. The freshman from East Brunswick, New Jersey and Martino were the only riders to pin blue once and red once in team classes. Rutgers teammate Demetra Fotiou was second to Bates in walk-trot-canter. Through the first class of the day the University of Connecticut was in first place, as freshman Anna Eligulashvili won the intermediate flat class which started the show. Joining the Huskies and Scarlet Knights with 17 points was Penn State University (the main campus in State College, PA). No member of the Nittany Lions placed above third (in a team class), with open rider Elizabeth Traband third twice and novice flat rider Caitlin O'Neil third in the last team class of the day behind Martino and Ammendolia. Delaware Valley University earned 12 of their 16 points in two rides. Alexis Martin won the second section of intermediate fences (Olivia Murray was second for team honey, the first SCAD rider of the day to earn a top-two ribbon) while Juliette Hopkins was second to Xiao in walk-trot. The University of Massachusetts at Amherst is located in Zone 1, Region 3 along with Mount Holyoke and the riders in the low levels paced these teams. 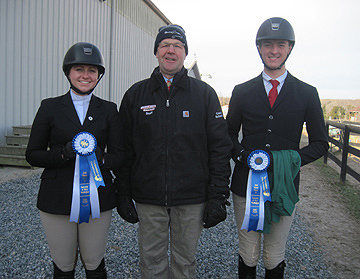 Aarya Malik was third in walk-trot while Noah Carello was third in walk-trot-canter for the Minutemen. Current Zone 3, Region 5 leading open rider Alyssa Kelly placed second in open fences to lead the University of Delaware to 11 points while host University of Mary Washington rounded out the scoring with six points. Erika Smith of the Eagles (same school nickname as Bridgewater College) was fourth in novice fences to account for their best ribbon of the day. Was the show indoors or was the show outdoors? The classes were held in the indoor at Hazelwild Farm but the horses were held outdoors. Following the show SCAD's Maddy Keck (Champion in the high medal division, on left) and Martino (the low medal division Champion) pose with the Tournament of Champions series trophy inside the indoor ring. 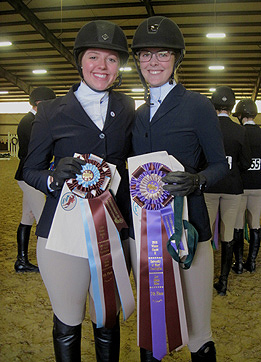 Both riders had previously won these classes and both had been part of a January 2018 celebration when SCAD was the Tournament of Champions series winner. Medal Detector: Back in the fall of 2006 the "Medal" division replaced the ride-off for high point rider at Tournament of Champions series events. The Medal class was for riders of any level who could jump to compete in a multi-phase division where those who flat well are called back to jump and consequently for further testing. That went so well that in recent seasons a second Medal division was created. The original Medal class is now the "High Medal" while the new one is the "Low Medal." Those who placed top five in the low medal were Kemp of Ohio University in fifth, Goucher freshman Emily Axel in fourth, Martin of Delaware Valley third, Ashley Jenkins of Penn State in second and the often-mentioned Martino in first. Fifth in the high medal went to Haley Cliver of Delaware Valley University (which is located in Pennsylvania, not Delaware) while fourth went to Kelly Bohnenberger of the University of Delaware (which really is in the state of Delaware). Edgar, Lawler and Keck were above the riders from the schools with 'Delaware' in their names. The Judge was familiar with the Tournament series: During his time on the Stonehill College equestrian team 2004 graduate Tom Brennan was part of a 2003 IHSA National Champion team and a rider in Tournament of Champions series events. On January 26th Brennan became the second graduate of a New England school to judge a Tournament show this season (2000 Tufts University graduate Katie Schaaf judged December 1st at Otterbein). Among the items added to Brennan's resume since receiving his Stonehill diploma include riding Gramercy Park to 2012 World Champion Hunter Horse of the year, providing color commentary on the USEF Network and even marrying former University of Massachusetts at Amherst rider Tracy White! What might have been and what might be: We will never know if Savannah College of Art and Design might have gone 4-and-0 in 2018-19 events (or even been beaten) had the January 12th Winter Tournament of Champions event in Weyer's Cave, Virginia taken place. In the long history of the Tournament only two shows have ever been cancelled due to weather issues. The first time was earlier this decade when a blizzard TKO'd a winter event ironically at Hazelwild Farm. The second time was only two weeks ago, as snow and ice concerns forced the cancellation of "Winter I" which Bridgewater College would have hosted. Winter II thankfully went on with Mary Washington hosting at Hazelwild on a chilly but snow-free day. The two weather-related cancellations have inspired Jim Arrigon to plan one Winter TOC event next January (rather than two) and a Spring TOC event perhaps in March of 2020 to bring the total to four which has been the norm for almost a decade now. The first of the four 2019-20 Tournament series events will be the Pre-Season Classic on September 21st in Storrs, Connecticut. According to Jim Arrigon the University of Connecticut has hosted twice before so this will be their third time with the responsibility. Campus Equestrian could not confirm the exact dates of the previous Tournament shows held at UConn's facility but one was definitely in September of 2002, for it was the first event Campus Equestrian covered following the launch of the site only a month earlier. January 26th Show Incidentals: Mostly cloudy skies, with temperatures reaching the upper 30's. Entire show held indoors. Judge: Tom Brennan, Charles Town, West Virginia. Stewards: Eddie Federwisch/Savannah College of Art & Design, Lizzie Fisch/Sweet Briar College and Alena Meacham/University of Connecticut. Savannah College of Art and Design head coach Ashley Henry is on the far right as the many Bees which competed for either team bumble or team honey swarm the ring for a photo with their many spoils of the day. Most importantly SCAD captured the Tournament Series Trophy for the sixth consecutive season. Nevertheless this awards presentation was especially sweet as the Bees became the first team ever to earn high point team honors at all the tournament events held in one season. Intermediate Equitation On The Flat, Section A: 1. Anna Eligulashvili, University of Connecticut. 2. Meghan McSpiritt, Rutgers University. 3. Lilly Hilgers, Savannah College of Art and Design - Team Honey. 4. Gabriella Fournier, Penn State University (State College). 5. Melissa Kay, University of Delaware. 6. Tess Von Hemel, Miami University of Ohio. Open Equitation Over Fences, Section A: 1. Michael Golinowski, Bridgewater College. 2. Alyssa Kelly, University of Delaware. 3. Irene Elise Powlick, Goucher College. 4. Carly Alder, Savannah College of Art and Design - Team Honey. 5. Kaitlin Duecker, Sweet Briar College. 6. Jen Szafir, University of Massachusetts at Amherst. Intermediate Equitation On The Flat, Section B: 1. Megan Heffernan, Bridgewater College. 2. Kaitlin Duecker, Sweet Briar College. 3. Michelle Smith, Randolph College. 4. Maddy Keck, Savannah College of Art and Design - Team Bumble. 5. Piper Lacey, Mount Holyoke College. 6. Lenna Hoff, Ohio University. Open Equitation Over Fences, Section B: 1. Lenna Hoff, Ohio University. 2. Adam Edgar, Savannah College of Art and Design - Team Bumble. 3. Elizabeth Traband, Penn State University (State College). 4. Jacqueline Lampert, University of Connecticut. 5.Julianna Ianuzi, University of Mary Washington. 6. Haley Hacala, Miami University of Ohio. Intermediate Equitation Over Fences, Section A: 1. Molly McLaughlin, Randolph College. 2. Tess Von Hemel, Miami University of Ohio. 3. Caydee Dickinsheets, Savannah College of Art and Design - Team Bumble. 4. Katie Kemp, Ohio University. 5. Mackenzie Gilligan, University of Massachusetts at Amherst. 6. Lauren Rinda, Penn State University (State College). Walk-Trot-Canter Equitation On The Flat, Section A: 1. Sinead O'Sullivan, Mount Holyoke College. 2. Hannah Foster, Bridgewater College. 3. Noah Carello, University of Massachusetts at Amherst. 4. Abby Bell, Sweet Briar College. 5. Nina Dellarte, Delaware Valley University. 6. Irina Hulse, Savannah College of Art and Design - Team Honey. Intermediate Equitation Over Fences, Section B: 1. Alexis Martin, Delaware Valley University. 2. Olivia Murray, Savannah College of Art and Design - Team Honey. 3. Emily Axel, Goucher College. 4. Piper Lacey, Mount Holyoke College. 5. Caroline Shipe, Bridgewater College. 6. Caroline Waters, Sweet Briar College. Walk-Trot Equitation On The Flat, Section A: 1. Boyu Liu, Savannah College of Art and Design - Team Bumble. 2. Katie Brown, Randolph College. 3. Aarya Malik, University of Massachusetts at Amherst. 4. Jessica Goodman, Bridgewater College. 5. Havah Berg, Goucher College. 6. Ruth Wilmot, University of Mary Washington. Novice Equitation On The Flat, Section A: 1. Addison Diaz, Savannah College of Art and Design - Team Honey. 2. Nadia Langer, Goucher College. 3. Arienne Martin, Ohio University. 4. Hannah Soifer, University of Connecticut. 5. Grace Muir, University of Massachusetts at Amherst. 6. Laura Perry, Delaware Valley University. Walk-Trot Equitation On The Flat, Section B: 1. Christine Xiao, Mount Holyoke College. 2. Juliette Hopkins, Delaware Valley University. 3. McKenna Devitch, Ohio University. 4. Jonathan De Blasi, Miami University of Ohio. 5. Pauli Born, Sweet Briar College. 6. Jessica Knowles, University of Delaware. Open Equitation On The Flat, Section A: 1. Victoria Lawler, Miami University of Ohio. 2. Adam Edgar, Savannah College of Art and Design - Team Bumble. 3. Elizabeth Traband, Penn State University (State College). 4. Katie Kemp, Ohio University. 5. Kirby Tidmore, Randolph College. 6. Mackenzie Gilligan, University of Massachusetts at Amherst. Walk-Trot-Canter Equitation On The Flat, Section B: 1. Ally Bates, Savannah College of Art and Design - Team Bumble. 2. Demetra Fotiou, Rutgers University. 3. Adeline Callihan, Goucher College. 4. Danielle Reynolds, University of Connecticut. 5. Abby Carpenter, Randolph College. 6. Samantha Wilson, Penn State University (State College). Novice Equitation Over Fences, Section A: 1. Katelyn Dugan, Bridgewater College. 2. Brady Martino, Savannah College of Art and Design - Team Bumble. 3. Sarah Miller, Sweet Briar College. 4. Erika South, University of Mary Washington. 5. Kara Garber, University of Delaware. 6. Bethany Pilon, University of Connecticut. Open Equitation On The Flat, Section B: 1. Irene Elise Powlick, Goucher College. 2. Michael Golinowski, Bridgewater College. 3. Chloe Kerschl, Sweet Briar College. 4. Carly Alder, Savannah College of Art and Design - Team Honey. 5. Franny Eremeeva, Mount Holyoke College. 6. Emily Cornell, Delaware Valley University. Novice Equitation Over Fences, Section B: 1. Meghan McSpiritt, Rutgers University. 2. Courtney Lewis, Ohio University. 3. Rachel Stockslager, Goucher College. 4. Ari Chinoporos, Miami University of Ohio. 5. Grace Amerling, Savannah College of Art and Design - Team Honey. 6. Grace Muir, University of Massachusetts at Amherst. Novice Equitation On The Flat, Section B: 1. Brady Martino, Savannah College of Art and Design - Team Bumble. 2. Isabel Ammendolia, Bridgewater College. 3. Caitlin O'Neil, Penn State University (State College). 4. Taylor Price, Randolph College. 5. Sierra Dunn, Mount Holyoke College. 6. Mary Macmillan, University of Delaware. Nicole Saidnaway (on left) and Ari Chinoporos (on right) grew up together in Massachusetts. Both went to schools far apart from each other, with Chinoporos heading west to Miami University of Ohio while Saidnaway stayed a little closer to home at the University of Connecticut. So what are the chances they would be side-by-side receiving ribbons one place apart in Virginia? One hundred percent, as Saidnaway was eighth and Chinoporos seventh in the low medal division. Riders entered in the medal divisions had to flat first, then hope for a callback to jump. Chinoporos and Saidnaway were in different sections of the flat for the record. Tournament of Champions Collegiate Low Medal: 1. Brady Martino, Savannah College of Art and Design. 2. Ashley Jenkins, Penn State University (State College). 3. Alexis Martin, Delaware Valley University. 4. Emily Axel, Goucher College. 5. Katie Kemp, Ohio University. 6. Grace Amerling, Savannah College of Art and Design. 7. Ari Chinoporos, Miami University of Ohio. 8. Nicole Saidnaway, University of Connecticut. 9. Alex Buchanan, University of Mary Washington. 10. Danielle Kulyk, Rutgers University. Tournament of Champions Collegiate High Medal: 1. Maddy Keck, Savannah College of Art and Design. 2. Victoria Lawler, Miami University of Art and Design. 3. Adam Edgar, Savannah College of Art and Design. 4. Kelly Bohnenberger, University of Delaware. 5. Haley Cliver, Delaware Valley University. 6. Michael Golinowski, Bridgewater College. 7. Elizabeth Traband, Penn State University (State College). 8. Courtney Sloan, Goucher College. 9. Irene Elise Powlick, Goucher College. 10. Emily Cornell, Delaware Valley University.